Interview, 7/7/2011, The Imaging Channel. I dug this up from the underground vault - archives of days gone by, reflections of the future. TIC: Do you have a “real” job? If so, what is it? Greg: Yes, I have a “real” job as the MPS Practice Manager at SIGMAnet, a 25-year-old, West Coast VAR. TIC: Do you wear a suit to this “real job,” or ever? Greg: OK, that’s funny. Yes, 9-5, I can be found usually sporting a suit, with a tie even. Odd thing is, many days I am the only person in the office in such garb. It’s Cali, and I am originally from the Midwest. Greg: I was born in Honolulu, Hawaii – Pearl Harbor, in that great big “coral pink” hospital in 1962. I grew up in a suburb just outside Detroit, graduating high school in 1980 – the same year of the Miracle on Ice, Mt. St. Helens’ eruption, the Olympics and Ronald Reagan accepting the Republican nomination in Detroit, at Joe Louis Arena. After college, I worked at INACOMP, making my way through a few other dealerships and VARs over a decade or so, always proposing computerized accounting systems. Those were wild times – PS/2s, COMPAQ, Novell networks and DOS 4.0. Taking a break from technology, I worked uniform sales – ahem, I mean, “Corporate Identity Programs” – for a great company, CINTAS. They transferred me out to Ontario, California, in 1999 to help open a new plant. I decided to get back to technology and jumped into a sales position with Océ. From there, I worked with a very nice Panasonic dealership in Anaheim, pushed on to IKON out of Redlands, and ultimately stumbled into a new thing with SIGMAnet, Managed Print Services. We started from scratch – oh, the stories I can tell. TIC: When did you get into MPS? Greg: Well, I started with the MPS practice in September of 2007. But while at IKON, I exposed myself to all the EDM I could and even worked intimately on a rather large FM project – MPS before there was such a thing. TIC: When did you create DOTC, and why? TIC: Did you ever imagine that it would grow into what DOTC has become today? Greg: Nope. I can still see the looks on all the faces of those copier dudes at Lyra 2009. 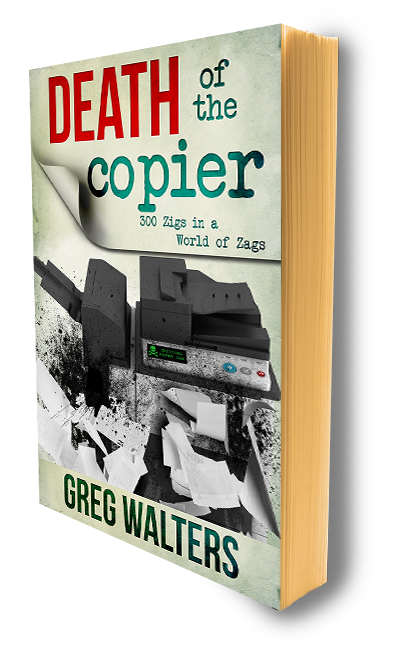 “Death of the Copier? Just who do you think you are?” LOL!I often comment how happy I was getting just 12 views a day, and most of those from my mom. I built the blog originally as a receptacle for things I was interested in. It evolved into a spot for me to put thoughts down one day and go back to read later. I honestly do write for an audience of one: me — and I crack me up. I must say, I am honored, humbled and thankful for all the great people DOTC has introduced in my life. No plan – just making it up as I go. TIC: What do you do in your free time? And hit the trails, get off the grid in my 2001 LandRover, Disco II – yes, it is a green vehicle. Metallic Forest Green, that is. Ha! By the way, new idea for a bumper sticker on a Prius: “My other car is a … car.” Get it? Sorry, that’s my Detroit showing. Anywho, I also like to get out to the paintball arenas and light up some newbs. I used to golf – had all the stuff. One day I figured I really didn’t need another reason to chase a beer-cart around all day. TIC: Greg Walters is certainly an interesting and busy person, both personally and professionally. In addition to blogging on DOTC, working at SIGMAnet and sitting on the board of the Managed Print Services Association (he currently serves as secretary), Greg will be joining the TIC Web team as a resident blogger, contributing bimonthly blogs to The Imaging of Greg. Be sure to check back on Monday, July 11, for his first post.